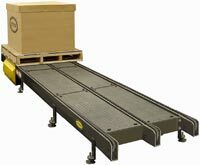 Horizontal drag chain conveyors tend to be used for pallet loads. They are ideal for handling heavy pallets up to 6,000 pounds, with frame widths up to 99-7/8". The Model DC-60 is a two strand drag chain conveyor. The conveyor is built with a drive, intermediate and tail sections on which two strands of #60 single-pitch chain travel. Each strand is a continuous loop and driven by a common drive shaft. Modular Assembly. Conveying speed: 30 Feet/Minute (constant). The Model DC-63 is a three strand drag chain conveyor for heavy pallets and other loads. The conveyor is made up of drive, intermediate and tail sections on which three strands of #60 single-pitch chain travel. Each strand is a continuous loop and driven by a common drive shaft.